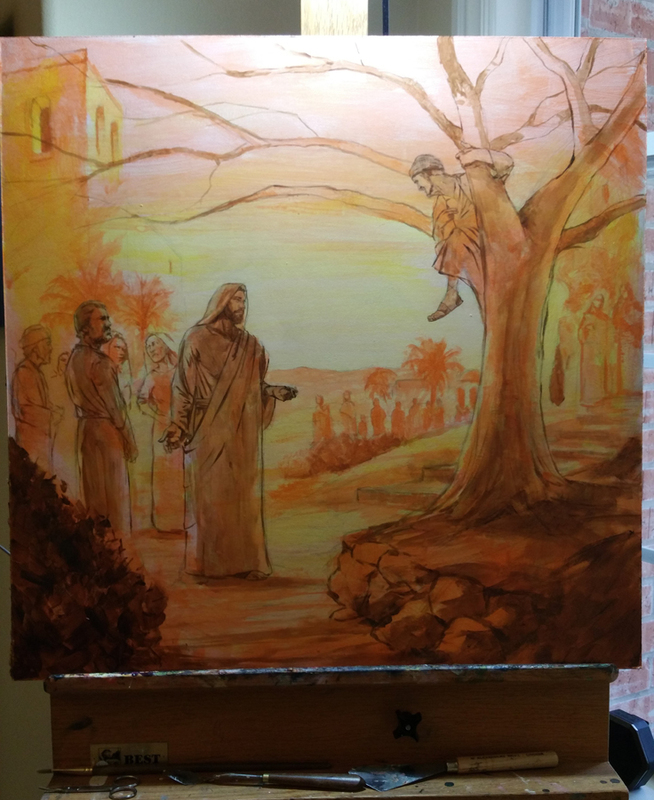 The first stage of painting is using one color, in this case it’s orange, to start laying in the undertone. This is important as it will influence the entire painting. I know ahead of time I want this painting to be a warm, orange tone piece. I plan most of my paintings that way in a series, so each one is a little different from the other. 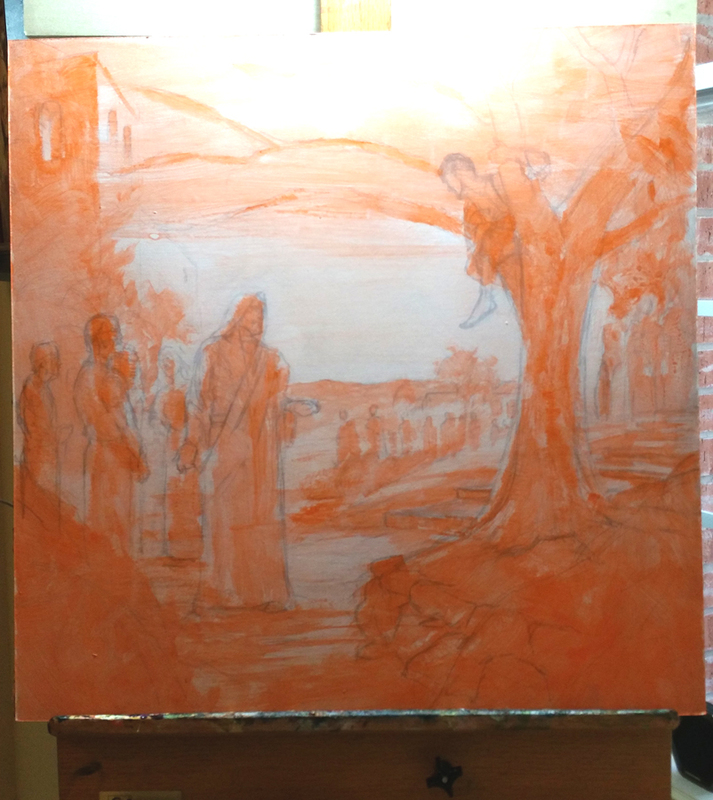 I lay in the acrylic orange in washes, without using any white paint, with a 1” or 2” brush. After a few minutes this should be dry, and I will move to a smaller brush and work slightly darker, establishing where the darks of the picture will be. Now I need to solidify my drawing and continue to develop the values of the painting. 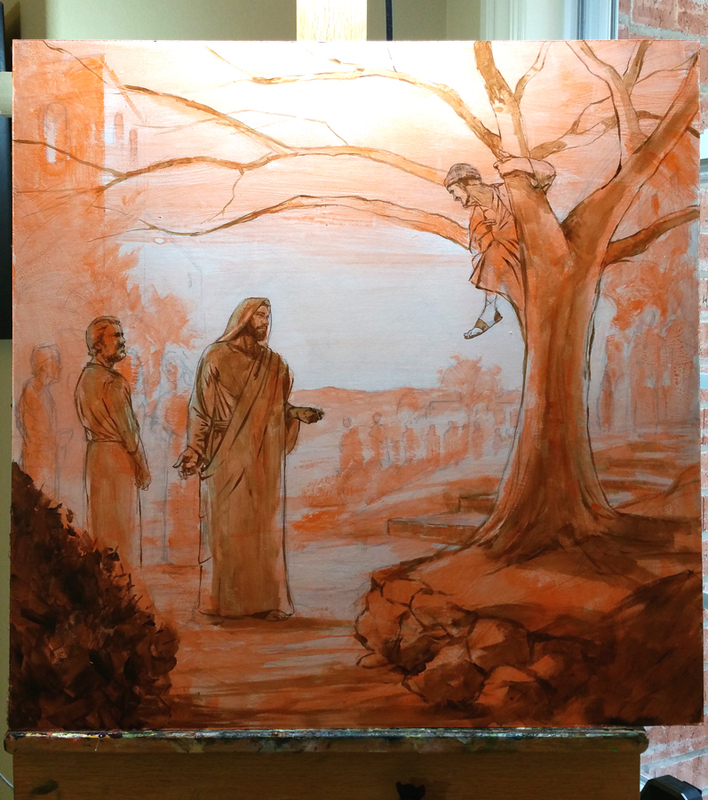 I use burnt umber in acrylic and a small round brush to go over the drawing so it doesn’t get “lost” as I paint. In order to achieve “depth” to a picture, I like to think of it much like Disney used for their mulitplane camera. Far distant background, middle ground (area of interest) and foreground (push everything into the picture and invite the viewer inside). I like the orange, but need it to be warmer, so I wash over the entire painting with yellow acrylic. Now on to the sky! I really like painting skies. I really think they are the supporting cast to the picture. Skies can set a mood for the whole thing. 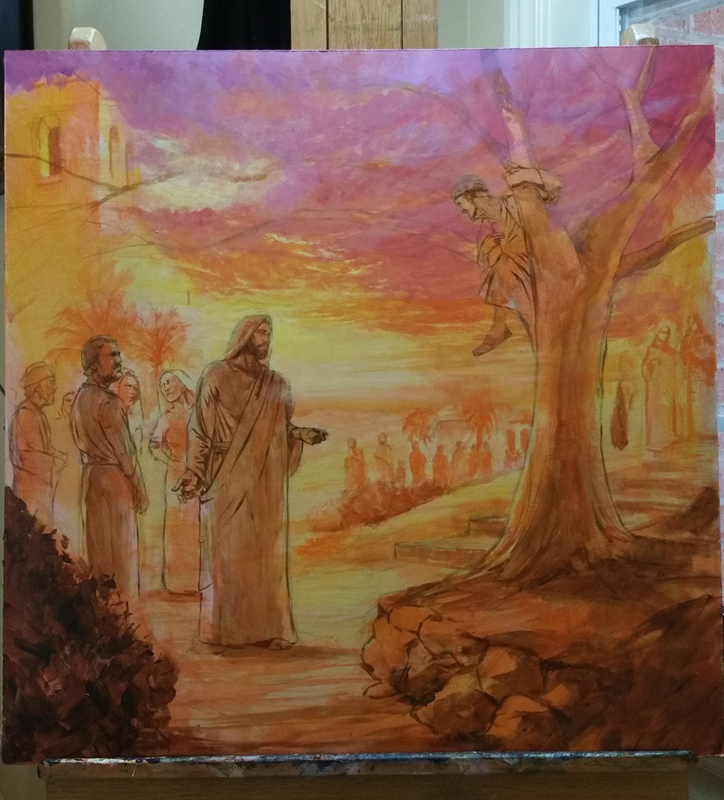 I choose to keep working in acrylic because I will have to paint a tree over the top of the sky, if I use oils, I would either have to wait for it to dry (I don’t have time) or use a drying agent. 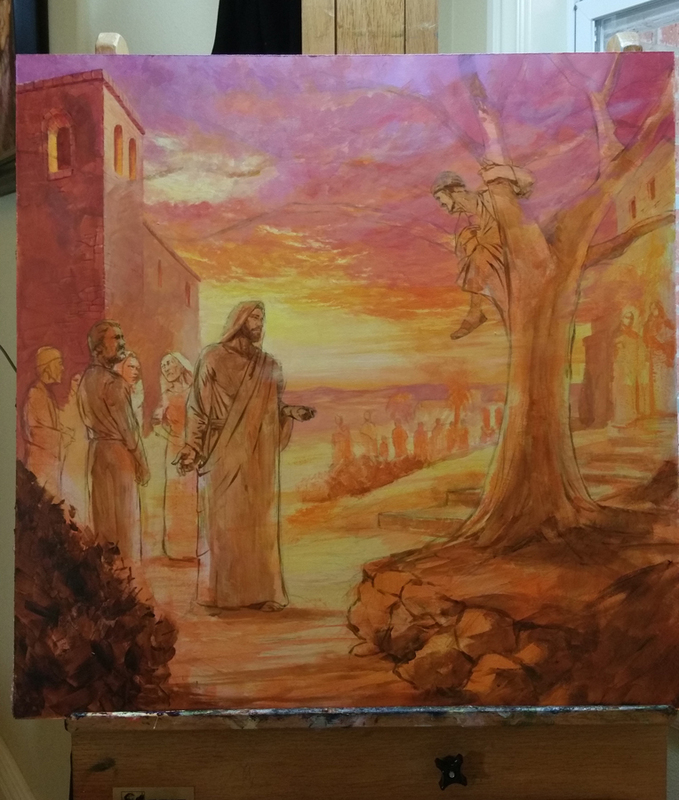 I choose to work with acrylics using purple, alizarin crimson, and yellow, and for the first time I will bring out a white acrylic and work in an opaque manner. I have to work pretty fast to blend the acrylics because they dry fast. I paint the building with acrylics, since part of the tree will extend to that part as well, I put the acrylics aside. Now on to my favorite part, the oil painting! Stay tuned for part 3, oil painting and finishing the illustration. I grew up in the Atlanta, Georgia area (small town called Lithonia to be exact) and started drawing at an early age. After high school, I entered the commercial art program at Pensacola Christian College. There I was able to work as an illustrator in the art studio of A Beka Book, where I worked for 3 years. After graduation I pursued a career of freelance illustration and continued learning my craft by studying with great artists and illustrators both past and present. I am fascinated by light and how it relates to edges and color. My goal is that each of my paintings capture the emotion of the subject, and not just the mere superficial facts. Please feel free to contact me if you have any questions or if I can help in any way. All images ©Copyright Kyle Douglas Henry unless otherwise noted. All rights reserved.